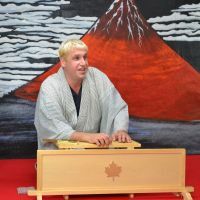 Katsura Sunshine wants to spread the world of rakugo (traditional comic storytelling) to people all over the world, including his home country Canada, by delivering English-translated versions. 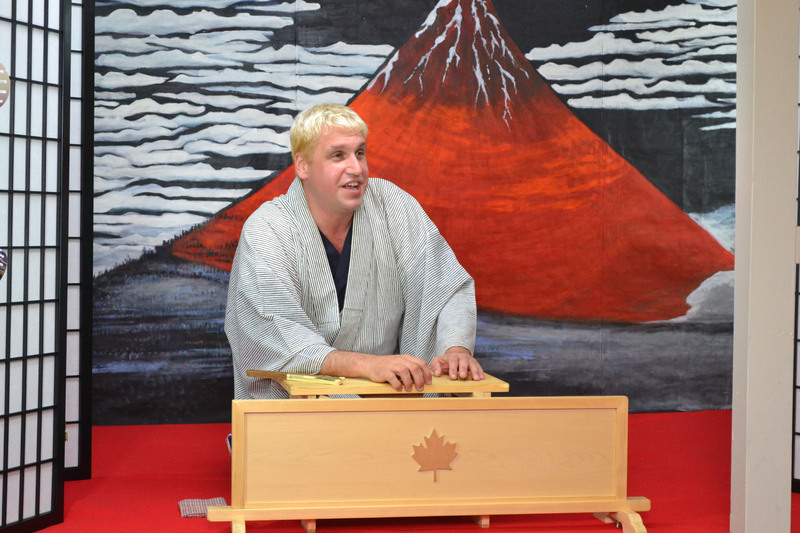 The 42-year-old Slovenian-Canadian, who was given the stage name from his master, Katsura Bunshi, after three years of apprenticeship, has already performed in Canada twice since last year. His dream is to eventually open his own yose (rakugo theater) in New York’s Off-Broadway and perform English rakugo. “I want to travel all over the world and do English rakugo, and make rakugo part of the Western vocabulary,” he said. Last June, Sunshine moved from Osaka, where he apprenticed under Bunshi, to Ise, Mie Prefecture, and opened a yose in his old farmhouse home — as part of a project by the Yoshimoto Kogyo entertainment agency to have entertainers in each prefecture. 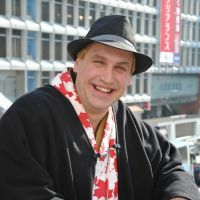 He performs traditional rakugo and sosaku (original) rakugo in Japanese there three days a week, and plans to add English rakugo to his repertoire to entertain audiences from abroad as well. While his first encounter with rakugo took place when he arrived in Japan in 1999, it was when he saw the performance by Bunshi — who was then called Katsura Sanshi — in 2008 that he really fell in love with the art to the point he decided to apprentice under the master storyteller. “It was like love at first sight. I thought if I put those stories into English, people in Canada would love it,” he said. After eight months of repeated requests, he managed to apprentice under Bunshi for three years from 2008. He received the stage name from the master in 2011, becoming the first foreigner to join the Kamigata (Osaka-style) rakugo association. Rakugo is a traditional art form that dates back 400 years, and as the 15th apprentice of Bunshi, Sunshine went through the traditional routine of any Japanese rakugo apprentice, for example, cleaning up the master’s house, doing his laundry, folding his kimono and carrying his bag wherever he went. Like any apprentice, he said he did not have to pay his master to learn rakugo from him. “Shugyo (apprenticeship) is trying to learn to read your master’s mind,” he said. And then when you finish the apprenticeship, you go in front of the audience and you should be able to read the audience’s mind as well. “Here’s my audience. Then you can tell them a story that they can come into your world, will laugh, and be entertained. That’s one of the thinkings behind the shugyo,” he said. Born and raised in Toronto, Sunshine worked as a playwright and composer of musical theater before coming to Japan. His musical version of Aristophanes’ “Clouds” was a success that ran for 15 months at a theater in Toronto. He arrived in Japan in 1999, planning to spend about six months to learn about Japanese culture, particularly kabuki, and then go back home to continue his career as a playwright and composer. “But I fell in love with Japan and Japanese culture as soon as I got here, so I knew right away that six months would not be enough,” he said. After taking a particular interest in rakugo, he entered Osaka University of Arts, where he studied under Akio Aiba, an expert in Japanese traditional comedy, and gained a master’s degree in rakugo studies. When he first saw Bunshi’s rakugo performance five years ago, he had already been in Japan for nine years, so he could understand Japanese pretty well, and felt that Bunshi’s rakugo was hilarious. “Also, it was new, original rakugo which at the same time showed a perfect respect for the tradition of rakugo. In a sense, I could feel that my master was creating the traditional rakugo of the future,” he recalls. “I knew that if I translated his stories into English and performed them abroad they would be adored as much as they are here. I just couldn’t wait to learn some stories from him and tell them in Canada. “But I didn’t just want to learn a few stories and do them abroad. I wanted to go through the same apprenticeship that Japanese storytellers did, so that I could really express this rakugo art abroad. Not to have done so would have been the same as telling half the story, in a sense. “And now that I have more and more opportunities to perform abroad, I am truly glad I took the route of doing the apprenticeship, and I am eternally grateful to my master for taking me on,” he said. Sunshine said he is intrigued by what he calls the “distinctive rakugo atmosphere,” which he says is different from Western theater. “In musical theater, when actors go up on stage, the attitude has to be, ‘I’m great. Look at me. I will entertain you.’ This is the confidence you have to have as an actor,” he said. Sunshine is also charmed by the fact that in rakugo and other Japanese traditional forms of art, everything is “very, very strict and structured.” A storyteller goes on stages on a simple setting — wearing a kimono, sitting on a zabuton (cushion) and use traditional tools such as sensu (fan) and tenugui (hand towel) as props. 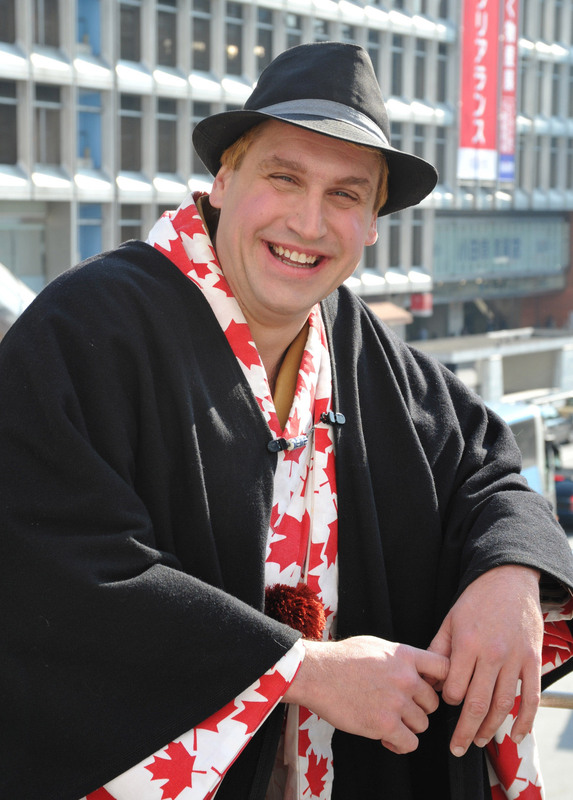 This year, he plans to hold a series of English rakugo performances in Canada, the U.S., Slovenia and Sri Lanka. “Learning to do rakugo properly is a life’s work. A lot of rakugo storytellers say your rakugo career starts when you’re 60 years old. It’s a very tough career, because you start storytelling in your 20s, and even if you realize you’re not good at it at 60, it’s too late. It’s not like, “Oh I’ll become a baseball player then,” so you have to keep going. I feel it’s very, very much a slow process,” he said. For more about Katsura Sunshine, visit sunshineinenglish.wordpress.com.